The name of George Roe is coming back. ONCE UPON A time the Guinness brewery shared the Thomas Street area of Dublin with the city’s biggest whiskey producer; the Thomas Street/George Roe Distillery. Indeed the Ireland Whiskey Trail states that in 1886 the Roe Distillery was putting out two million gallons a year “twice as much as the John Jameson Distillery and probably the highest output of any distillery in the world at that time”. 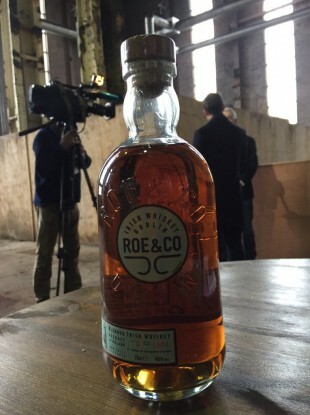 Now, Diageo has announced that it’s reviving the George Roe name, and giving it to its new premium blended Irish whiskey, Roe and Co.
Building on a popular observation that ‘whiskey is the new burrito/craft beer/doughnut’, Diageo says it saw a “clear opportunity” to enter the whiskey market. That tower that stands prominently on the Guinness property is called St Patrick’s Tower, and used to be a windmill which powered the Thomas Street Distillery. The Roe Distillery suffered from competition from Scottish distillers and a downturn in the export market, leading to the closure of the Thomas Street operation in the mid 1920s. Diageo plans to invest €25 million over three years to build a new premium whiskey distillery and visitor’s centre on the site of the former Guinness Power House on Thomas Street. It’s being touted as complimentary to the Guinness Storehouse. Email “Diageo just announced a whiskey version of the Storehouse, and a brand new whiskey to go with it”. Feedback on “Diageo just announced a whiskey version of the Storehouse, and a brand new whiskey to go with it”.